This entry was posted in General News and tagged ACES, extension, food on June 14, 2013 by Wire Eagle. AUBURN UNIVERSITY – The Alabama Cooperative Extension System Food Safety Team is offering safe food handling training to fruit and vegetable producers who sell their commodities at farmers markets throughout the state, with the ultimate goal of preventing outbreaks of foodborne illness. The training, titled “Enhancing the Safety of Locally Grown Produce,” is designed to alert sellers at farmers markets to the handling practices most commonly linked with foodborne illness outbreaks. This entry was posted in Events and tagged conference, food on February 19, 2013 by Wire Eagle. AUBURN UNIVERSITY – After discovering what many consider to be the perfect chicken salad recipe and starting their first restaurant in Auburn only five years ago, Stacy Brown and her business partner and husband, Kevin Brown, are now in the process of establishing more than 50 Chicken Salad Chick franchises in five states. Countless aspiring food entrepreneurs want what the Browns have achieved: a business that is popular, thriving, and, most of all, highly profitable. Stacy Brown and several other successful entrepreneurs will share their experiences of starting and growing their own food-related businesses at Auburn University’s Food Systems Institute’s Food Entrepreneur Conference March 14-15 at The Hotel at Auburn University and Dixon Conference Center. This entry was posted in Community, Faculty and tagged College of Human Sciences, food, Henton, hunger, White House on September 7, 2012 by Wire Eagle. AUBURN UNIVERSITY – June Henton, dean of the College of Human Sciences at Auburn University, was recognized at the White House this week as a Strengthening Food Security Champion of Change. The White House recognizes Americans each week who are making positive change in their communities, but this was the first time food security was acknowledged. Almost 1 billion people do not have access to a sufficient supply of nutritious and safe food, and 16 million children in the United States experience food insecurity each year, according to information provided by the White House. Henton and 11 other leaders were selected for using innovative approaches to ensure that no man, woman or child goes hungry and for inspiring others to do the same. This entry was posted in Community, Events and tagged food, laureate, prize, world on October 26, 2011 by Wire Eagle. AUBURN – Ethiopia-born Gebisa Ejeta will address the challenges of feeding the Earth’s growing population, Thursday, Nov. 3, as the Auburn University College of Agriculture’s fall 2011 York Distinguished Lecturer. He will speak on “Meeting Global Food Demands: Research and Education Needs,” at 7 p.m. in The Hotel at Auburn University and Dixon Conference Center ballroom. 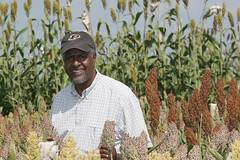 Ejeta is an internationally acclaimed Purdue University plant breeder whose development of improved sorghum cultivars for food and feed use worldwide earned him the 2009 World Food Prize. This entry was posted in Campus Announcement and tagged food, supply on February 23, 2011 by Wire Eagle. AUBURN – Patricia Curtis has been named director of the Auburn University Food Systems Initiative, an interdisciplinary, multi-institutional program that integrates research, outreach and academic efforts to enhance the safety of the nation’s food supply from producer to consumer. The initiative is a collaborative effort between the Office of the Vice President for Research and the Alabama Agricultural Experiment Station. Curtis officially assumed the position Feb. 1.